To check the status on a claim visit www.disasterassistance.gov. Visit our list of stress management resources. FEMA, local government agencies and other federal partners continue supporting the Government of Puerto Rico’s plan for recovery after Hurricane Maria. With more than $8.5 billion granted so far for Public Assistance, Individual Assistance and Mitigation grants, the island is better positioned to build back stronger. The Government of Puerto Rico and FEMA have opened community recovery centers to address local needs and expedite recovery assistance for survivors of hurricanes Irma and María. The centers serve all community members, and visitors do not have to be registered with FEMA to access these services. Representatives from local and volunteer agencies are available at centers across the island to provide assistance with housing repairs, commodities and clothing, rental resources, FEMA case review, emotional and spiritual wellness services and legal services. The Disaster Case Management Program is a FEMA-funded program that provides disaster survivors a case worker who will aid the survivor in developing a recovery plan. Together, they will work toward achieving the survivor’s recovery goals. FEMA's Public Assistance program provides grants to eligible government and certain private nonprofit organizations. This assistance is granted for debris removal, life-saving emergency protective measures and the repair, replacement or restoration of disaster-damaged facilities. The program also encourages protection of these damaged facilities from future events by providingassistance for hazard mitigation measures during the recovery process. The Public Assistance program is funded by FEMA and administered by the Government of Puerto Rico. FEMA obligates funding for these projects directly to Puerto Rico. FEMA’s experience in long term recovery will be instrumental in connecting Puerto Rico’s unmet needs to the larger world of philanthropic resources and expertise. FEMA’s Hub of Philanthropic Engagement focuses on increasing the role of philanthropy in Puerto Rico’s long-term recovery. The Voluntary Agencies Leading and Organizing Repair program, or VALOR, provides operational support to voluntary agencies performing work and services essential to sustaining life and protecting health, safety and property. Hurricane season is officially over, but residents should remember that disaster preparedness is a year-round responsibility. Having a preparedness plan helps everyone act quickly and decisively in the face of a disaster and can minimize loss of property and prevent death and injury. An emergency plan should include ensuring those with disabilities or special needs have a proper evacuation plan. Plan transportation needs ahead of time and make sure those with medical needs have backup power for equipment. Find tips at Disasters Happen. Prepare Now. Learn How. A Mitigation Assessment Team was deployed to Puerto Rico in response to Hurricane Maria to evaluate the performance of buildings and infrastructure. Recovery Advisories are based on these field observations and provide information to assist with rebuilding decisions in the aftermath of the 2017 hurricanes as well as any future flooding or high wind events. This guidance is intended for homeowners, designers, building owners and officials, architects, engineers, and contractors; however, can provide helpful information for other stakeholders as well. 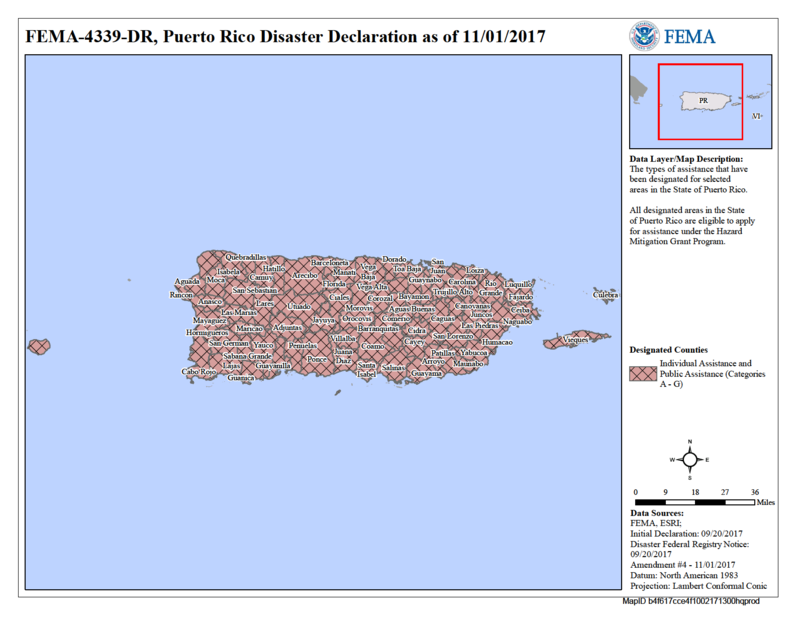 Assistance from the Federal Emergency Management Agency (FEMA) is available to help individuals and families affected by Hurricanes Irma and Maria take care of necessary expenses and serious needs that are not covered by insurance or other forms of assistance. Assistance to pay for medical or dental expenses caused by the disaster. This includes hospital and ambulance services, and medication replacement. Assistance for expenses incurred due to a death caused by the disaster. Expenses include the cost of a casket or urn and funeral services. Assistance for increased child care costs for children aged 13 and under, or children with a disability aged 14 to 18. We will provide rental assistance directly to disaster survivors, who are then responsible for finding available rental resources of their choosing. The amount of monthly rental assistance available to survivors who evacuated to the Continental United States depends upon the county or parish where the survivor has relocated following Hurricane Maria. That is why it is so important to keep your contact information updated with FEMA. Important inspection information for survivors in the U.S.
We are allowing survivors to verbally designate a local point of contact or representative to act on their behalf, if they are unable to be present for an inspection. If you have been contacted by an inspector, let the inspector know who your local point of contact is and how the inspector can contact them. The U.S. Army Corps of Engineers will also accept a local representative in order to install a blue roof on a survivor’s home. Survivors who are unable to physically sign up for the Blue Roof Program, or provide a right of entry form, because they are displaced should call 888-766-3258. All appeals must be made in the form of a signed letter within 60 days of the date on the determination letter. Appeals may also be faxed to: 1-800-827-8112, Attention: FEMA. You can also call the helpline at 800-621-FEMA (3362) or TTY 800-462-7585. Disasters bring out criminals looking to prey on survivors who appear to be easy targets for their scams. Survivors should be aware that fraud and scams can occur anytime. FEMA encourages survivors to be alert and report any suspicious activity or potential fraud by scam artists, identity thieves and other criminals. Anyone who suspects fraud or scams should call the FEMA Disaster Fraud Hotline at 866-720-5721. The toll-free number is open 24 hours a day. Common tactics used by scam artists include phone calls from people claiming to work for FEMA. The caller may ask for the survivor’s Social Security number, income or banking information. Survivors should never trust someone claiming to be a disaster assistance employee asking for money. FEMA does not endorse any commercial business, product or service, and local and federal disaster assistance workers do not solicit or accept money. Survivors of Hurricane Maria are urged to be aware of con artists trying to rip them off by claiming they will register them or help obtain disaster relief. Take a picture of your contractor, his vehicle and its license plate. Take a picture of the contractor’s business card and his driver’s license. If you received a letter from us indicating that your application for disaster assistance is under investigation for fraud, read it carefully. Applications may be under investigation for different reasons, such as a possible error when registering. Call the FEMA helpline within 30 days from the date of the letter to discuss your situation. If you DID apply for assistance, we can make sure your application information is correct and updated. If you DID NOT apply for assistance, please let us know that the case may be fraudulent. Call the helpline to speak to a representative by dialing 1-800-621-3362 (711 or VRS available), or 1-800-462-7585 for TTY. Browse through our library of disaster recovery video resources for people with disabilities. The Center For Disease Prevention (CDC) has additional informational videos in American Sign Language that are captioned in Spanish. If you haven’t heard from us after applying for assistance, you may need to update your contact information. If you changed your address or phone, even temporarily, be sure to let us know. For other inquiries, visit FEMA's Media Contacts or call 202-646-3272.